When Ben at Mooo Design contacted me recently and asked if I would like to review a product, I was delighted. Yes, yes, yes I would! 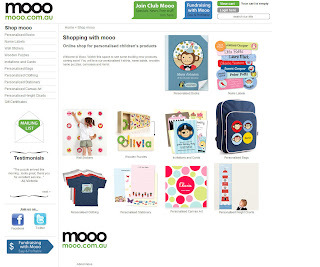 If you're not familiar with Mooo Design, its an Australian store online, that specialises in unique baby and children's gifts and clothing. They offer a range of really beautiful personalised products for baby, toddlers and kids. Their website is brimming with eye candy. Anyway, Ben's offer was serendipitious. Back here at Chez Hoppo Bumpo, I'd been bemoaning the fact that the main wall in the playroom was looking a bit shabby (read: decorated with tattered Star Wars posters and some unauthorised orange pencil). 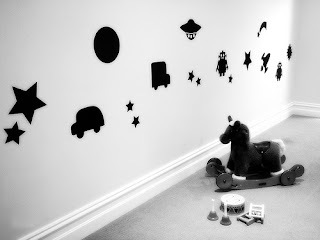 So I asked whether I might review the (removable) Chalkboard Wall Stickers. And this is what turned up - a beautiful mixed pack of large stars, space ships, cars, robots and other fun shapes. Argy and Bargy were pretty excited and gave me a hand with putting the stickers up. The shapes were up in no time at all and looked fantastic (see above). The boys have really loved drawing and "writing" on the fun shapes. The robots and cars have been particularly popular. 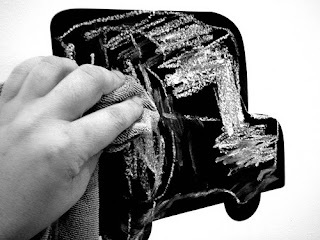 Even after being heavily decorated, the high quality chalkboard wipes perfectly clean with a soft cloth. Fabulous! If you are looking for a fun way to decorate a wall at home - or for a gift idea - I can highly recommend these Wall Stickers. With a range of shapes and sizes to choose from, what's not to love? A special thanks to Mooo Design for your generosity - you've transformed our playroom! Now for the fun bit for you. When I was looking around the Mooo Design website I noticed that the store has gift certificates. So, I would like to give one reader a gift: a voucher to the value of AUD$20 to use for a spot of shopping at Mooo Design. To be in the running all you need to do is leave a comment here (... and don't forget to go take a look around Mooo Design, too!). Please make sure that you leave a valid link or e-mail address so that I can contact you if you win. Everyone is welcome to enter. I will randomly draw a winner from the people who have commented before midnight on Sunday 31 October (local time, Melbourne Australia) the following morning. The gift voucher will be e-mailed. EDIT: Entries have now closed for the giveaway. To see more of October's blogging festival Blogtoberfest hop over here. These look great! I love Mooo! I love the blackboard stickers. They might help curb all the drawing on walls around here. How fantastic! I like those happy days wall stickers, and our course the bunnies! Mmmm don't we all have stories of "unauthorised" colouring-in - I can't go past the blackboard stickers either! I have bought a couple of mooo things before (puzzle and labels) - thanks for reminding me about them! I know some little boys who would love some chalkboard stickers (and I know their mum would appreciate it if they stopped drawing on the walls)! 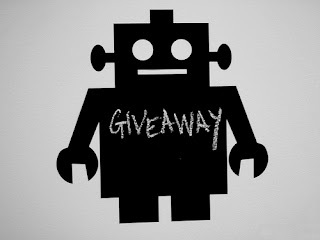 I'd definitely put the voucher toward some of those chalkboard stick-on robots! Do those chalkboard stickers come with children who only draw 'within the lines'? Cooper has taken a liking to drawing on our studio whiteboard that we use for brainstorming, tasks etc, but there appears to be some pink and blue lines that have gone beyond the white bit. Then again, maybe it was Nicole when i wasn't looking? Do I get an extra entry for telling you I love norks! Ooh! Ooh! Small girl's irthday coming up...pick me! pick me!! Loving the look of those chalkboard stickers!! Cute! :) Someone is going to be a happy winner! Wow! That's so nice! I like chalkboards and if they come as butterflies - what else do girls love?! wow chalkboard stickers - what a great idea!! They are a great idea - wonder if they would stop all the random scribbling on the wall? We have some great Mooo t-shirts. 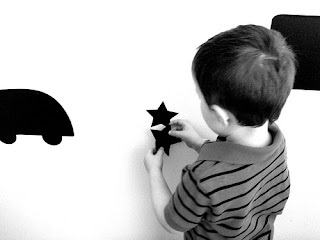 imagining painting a landscape mural on the wall as a backdrop to the chalkboard stickers...fun! I'm totally sold on the idea of those stickers... Particularly after my own disasters with chalkboard paint. 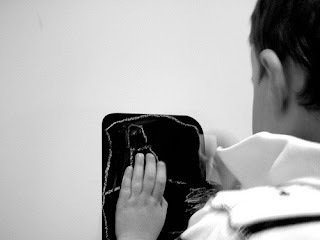 It'd be great to have something, um, removable for the boys to draw on! they look like great fun!!! Oh cool! I'm a bit on Wendy's wavelength, would totally put them in the kitchen for some recipe writing and lists and stuff! I love Mooo! I've bought lots of gifts for friends' kids from their site - it would be great to get something for my own.